Pretty much all social media sites now need an avatar. Rather than continue to use a photo, as I’ve been doing in the past, I thought that my avatar should reflect my 3D illustration skill. 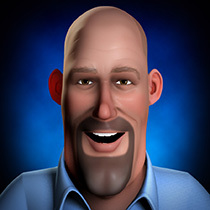 So, I decided to put those skills to good use and built a 3D caricature of myself. I wanted it to be friendly and fun, but I also wanted it to actually look like me. To accomplish the “look like me” aspect, I began by building a realistic mesh and tweaking it until it did look like me. Then I re-shaped it, exaggerating certain features and minimizing others, until it took on a cartoon quality. UV mapped it, hand-painted skin textures, set up a sub-surface scatter shader for the skin, added lighting and this is the result. Exaggerate ? You ? of course I only sort of understand what you did, process wise but damn – its you. Glad you are still churning stuff out.